Our marijuana medium page will guide you through the different mediums commonly used when growing marijuana. This covers all the main types of soil, hydroponics, coco and others. Whatever you choose, we’ve got you covered. When growing marijuana outdoors, soil or a mix of soil and compost is what is used. When growing indoors, soil can be used, though growers often prefer to grow hydroponically using different mediums. Below is a simple explanation of the different mediums commonly used. Marijuana is often called a weed and like a weed it will grow in almost anything you can think of. As long as the roots have room to grow, are kept moist and are supplied with oxygen and nutrients the plant will thrive. Soil or compost of one sort or another is a good medium, it is natural easy to use and available everywhere. Try using a sterilised loose, non- peat based potting compost mixed 50/50 with a soil conditioner like perlite. Perlite and vermiculite are soil conditioners. They look similar but Vermiculite contains small amounts of nutrients. It’s OK to use perlite on its own but vermiculite is best used in small amounts mixed with other mediums. Rockwool is an excellent medium for hydroponic use. It does however have some drawbacks. Just like the insulation variety, when dry it’s dangerous to handle. It also has a high p.h. value and is hard to reuse or recycle. Pea gravel or clay pellets are a good reusable medium that can be used in pots. These little marble sized balls absorb loads and loads of water and release it slowly. Again excellent for hydroponics and safer than rockwool. 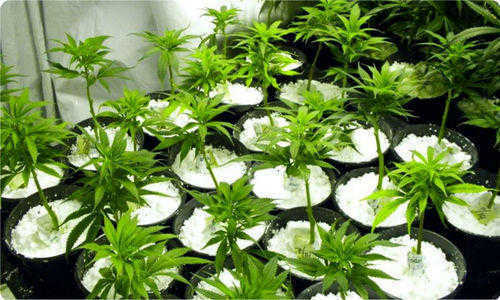 Marijuana uses available nutrients very quickly so mixing in nutrients with the growing medium can be a bit of an art. It’s easier to leave the mixture plain and give plants nutrients in their water as and when they require them. Washed building sand can also be used, but again use it in a mixture. Sand is cheap and heavy, most other mediums are not, so sand is good to give a bit of weight to pots that might fall over due to the lightness of the medium. The N.F.T. technique produces good results using small cubes of rockwool, or pots of perlite, placed on a thin mat that is drip fed a nutrient solution. The plant roots grow out the cubes or pots and weave through the wet matting.